Ponywolf attended PAX last week and did demos of Time Golf Squad and Skipchaser. It’s always great to put a controller in a gamer’s hand and just sit back and watch. We’ve really focused on the first impression—about 15 minutes of gameplay for each game. This usually means “cutting the fat” and getting into the fun of the game faster than you would in a full gaming session, but it also helps us close the gaps on small features that are missing from the experience. Now we’re off to the Austin Game Conference in (you guessed it) Austin. We are so grateful to Intel for selecting us to demo Time Golf Squad in their Developer Showcase on the Expo floor. It's Time Golf Squad Time! It's the week of the Game Developers Conference in San Francisco. The GDC has some personal significance to me, because it's where I got my start in the industry way back in 1998. My start-up at the time was called NO2 Games (pronounced In-Oh-Two) and we entered the Independent Games Festival with a futuristic minigolf game called Miniverse. Well we are back at it this year, heading to the San Fransisco with my new studio Ponywolf and with a unique adventure golf game called Time Golf Squad. Click the logo below to watch our launch trailer. Think of TGS as a "putt and click" adventure game. Your team of four heroes, each with individual talents, trek though space and time to save the universe. The kind of story that suits our visual presentation--a combination of the kinds of video games and Saturday morning cartoons you would have seen in the 1980s. We also developed animation techniques to let us bring pixel-like characters to life with more expressions and range that traditional pixel art animation. We've been sharing our progress on Twitter and debuted the animated style in our Indie Speed Run entry Wasteland Golf--the spiritual predecessor to Time Golf Squad. Our plan is to launch on both PC and Mac this summer via Itch, GameJolt and possibly Steam. Sign up for updates below or follow @ponywolf on Twitter. Last month we shared Wasteland Golf, our 2015 entry in the Indie Speed Run. This week we are proud to say we have been selected as one of the 10 finalist for Best of Show. Also, the game portal GameJolt featured us on their front page last Friday generating over a thousand downloads in just a few days. Want to see what a gamer thinks, or just don't feel like playing? Check out SnowyGaming's play-though video on YouTube. All in all, we had a great time making the game and it's been very fun (and informative) watching the community play and talk about the game across YouTube, Twitter and Facebook. We hope to expand the scope of this game and release it widely in 2016. Follow our site, or our Twitter for more information as we have it. We are happy to announce Wasteland Golf, our entry in the 2015 Indie Speed Run. The Indie Speed Run is a choose-your-own 48 hours game jam which allows some flexibility for busy teams to develop a concept without being locked into a rigid schedule. Relying on our suite of tools, we we're able to create flexible game world quickly and experiment with some mechanics that have been gnawing at the back of our collective skull. The end result is a simple, but fun take on golf. We hope you enjoy it. Download and vote on the PC version here, or get the Mac version on our itch.io page. When Urthworx asked us to help the NBA bring the puzzle back to this internationally recognized organization, how could we say no? Urthworx's NBA Escape is a mobile puzzle game in it’s purest form, brought to life in the fictional universe of The Dribbler and crossing over into the real world with is inclusion (and participation) of 90 current NBA stars. Casual in play and presentation, there’s a rich and challenging puzzle element that requires accuracy and timing. Targeted for Android and iOS, NBA Escape uses pseudo-realistic 2D physics engine combined with cartoon styling and simple gameplay that casual gamers have come to expect. NBA Escape is our first participation in a AAA mobile title and was very much a collaboration of talented people and organizations. Our involvement began when we were approached by Urthworx to help them create a game design that would appeal to both a causal mobile gamer and the core NBA fan. Urthworx had built a rich universe both visually and in back-story with a clear vision of how the NBA players (and gamers) would play a central roll. 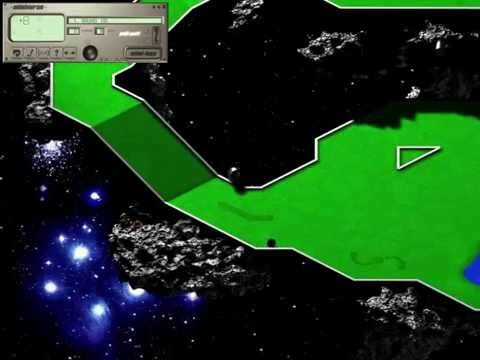 Various prototypes, level editing tools, in-game systems and physics models were built to provide an experience that feels familiar but has uniqueness all its own. Experimental versions of the game were built with minimal graphics as the team worked to find the gameplay “hook” and bring it to life. Part of our game design process is rapidly creating something fun with minimal graphics. We play it to death, possibly scrapping it to start over—until we find a mechanic that works. We were able to leverage open source tools and implement basic physics properties layered on top of the illustrations to provide level designers the tools to visually and rapidly construct levels from any desktop. Level geometry was abstracted from the visuals allowing for visually appealing designs that keep collision calculations to a minimum. Using 2D skeletal based animation we brought a host of creatures to life on various levels of hardware. Digitized illustrations of the “ballbots” were cut apart and trimmed then assigned to an animated bone structure. This kept processing overhead low but added a spark of life to residents of Dribbler’s evil fortress. Many parts of the game world are complex physics simulations, like the hoop and net, made of multiple physics joints. They bounce and react to collisions in an exaggerated, but visually realistic way. Ponywolf also constructed a custom physics-based particle engine that adds another layer of cartoonish realism to the game. The final product is very polished and is a good balance of casual gameplay, top shelf visuals and licensed content. We couldn’t be more excited to see how gamers react to the uniqueness of Urthworx's NBA Escape. Or grab our RSS feed, which is cool. By signing up, you agree to our terms. Thank you! You will probably regret it. © 2016 Ponywolf, LLC. All rights reserved. PonyWolf is a Drake Cooper company. View our Terms & Privacy. The NBA and NBA member team identifications are the intellectual property of NBA Properties, Inc. and the respective NBA member teams. 2015 NBA Properties, Inc. All Rights Reserved.